Combine all ingredients in a blender, blend briefly and place in cooler for 2 hours to allow infusion; strain and then use to garnish plate. Place water into a small sauté pan and bring to a boil then turn heat to a low. While water comes to a boil place corn oil in another sauté pan and bring to almost the smoke point. Briefly pass ancho chile through hot oil then drop into sauté pan with hot water and turn off heat. Drop chipotle chile into water; both chiles should be submerged in hot water; set aside. Place tomatoes into the pan with the hot oil and caramelize one side then turn over and place in broiler on medium heat of oven at 350°F. Cook until lightly charred and cooked all the way through, approximately 10 minutes. Just before tomatoes are done, drop garlic into pan and roast lightly browning on all sides. Combine 2 of the roasted tomatoes and garlic, chiles into blender and blend until smooth. Strain through a perforated chinois and add unsalted butter, chopped cilantro, and 2 oz of the Grey Poupon® Classic Dijon Mustard. Season, adjust consistency and serve hot. This sauce is very much driven by the quality and spice in the dry chiles, what that means is that depending on how fresh and potent the chiles are determines how many tomatoes and how much of the Grey Poupon® Classic Dijon Mustard one will use in this recipe. Luckily the ratio is simple, use 1 ounce for every 1 tomato. Hence if you need to use 3 tomatoes because the chiles are too strong then you will need 3 ounces of the mustard. In a food processor combine the flour and salt and incorporate well. While still on add the wet ingredients slowly allowing time for the ingredients to incorporate well. The mix should resemble wet sand. Add chopped mint incorporate by hand then form mix into 6 firm balls. Roll dough balls out as thin as possible using flour to dust if necessary then cut desired shape to garnish plate. Bake at 300°F for 10 minutes or until golden brown. Combine all ingredients in a food processor and process until incorporated evenly, scrape sides often; Set aside. Season and sauté all vegetables individually except spinach, then using 6 metal 2-inch rings layer vegetables and thin slices of goat cheese. Place all rings in a half sheet pan and place in a 150°F oven for 15 minutes. Just before plating, season and sauté spinach in butter and place a few wilted leaves in every mold over layered vegetables. Serve hot. Cut and clean lamb saddle if necessary, or clean loins of access fat and silver skin. Season. Place oil in appropriate size pan and sear loins then remove from heat. Spread Grey Poupon® Classic Dijon Mustard Crust over top of loin and place in convection oven at 400°F and cook to medium. Rest, slice, and then serve immediately. Mix Grey Poupon® Classic Dijon Mustard and dry white wine and briefly marinate the scallop. Wrap each scallop with the Serrano ham covering the round of the scallop. Use oil to sear the scallop browning all sides; cook to medium well and serve immediately. Pour approximately 2 ounces of the Romesco sauce on plate. Using an offset spatula, remove a vegetable parfait from sheet pan (including steel mold) and place on romesco sauce. Gently remove mold and place Romesco tuile around stacked vegetables. 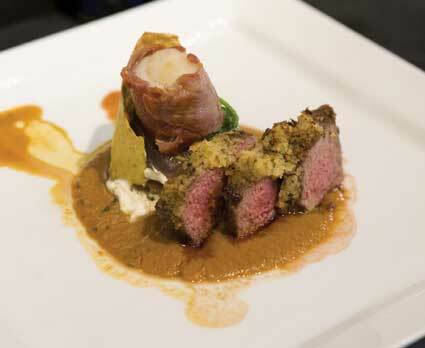 Place seared scallop atop the wilted spinach, and then slice lamb and arrange in front of vegetable parfait. Decorate plate with mustard mint oil then serve.